Scientists at Pacific Northwest National Laboratory and Purdue University collaborated to prepare an invited review article on ion soft-landing, which is where a beam of selected complex ions is gently deposited onto a surface. (Illustration by Rose Perry, PNNL). Enlarge Image. Today’s demanding applications in chemical manufacturing, energy generation and storage, pollution abatement, and health care are driving development of new materials with catalytic and optoelectronic functionalities. However, to predict and control the properties of such materials, scientists have been studying their development process at a molecular level. Frequently, a detailed understanding is impeded by the presence of a complex and poorly defined soup of spectator molecules that complicate interpretation of experimental results and make high-level theoretical modeling difficult. To highlight a novel approach to overcoming this challenge, scientists at Pacific Northwest National Laboratory (PNNL) and Purdue University teamed to review the ion soft-landing technique and its application to materials synthesis. Using this technique to gently place selected molecules onto surfaces lets scientists maintain exquisite control over the molecular ingredients that make up complex materials. In the review article, Julia Laskin, Grant Johnson, Jonas Warneke, and Venkateshkumar “Venky” Prabhakaran describe the approach and benefits of the ion soft-landing technique. For example, such precise control is achieved by first converting molecules into ions, which are easy to manipulate using electric and magnetic fields. The ions are then accurately sorted by their composition and ionic charge state and delivered as a concentrated beam of known shape and size to a surface to prepare tailored films and nanostructures. The resulting materials have predetermined compositions, which makes their measured physical properties and chemical reactivity easier to attribute to specific geometric and electronic features observed experimentally. This, in turn, enables theoretical modeling and a predictive—as opposed to a trial-and-error—approach to material design. “Ion soft-landing allows scientists to precisely control the composition and coverage of a wide range of molecules including non-volatile species that are otherwise difficult to deposit,” said Johnson, a physical chemist at PNNL. Johnson mentioned that the technique may also be used to generate novel clusters and nanoparticles using energetic sputtering-based techniques as well as highly reactive intermediates that cannot be produced using conventional methods. These scientists were invited to write the review because of their leading roles in developing the technique for studies in energy storage, materials synthesis, and catalysis and their substantial contributions to the wider field of ion-surface interactions. Why it matters: Understanding structure-property relationships is essential to designing improved materials for future applications. Such understanding allows researchers to avoid the labor-intensive, time-consuming, and costly trial-and-error experiments that are otherwise necessary to explore how different parameters influence the properties and performance of new materials. Structure-property relationships are challenging to extract from complex mixtures where the presence of other inactive compounds obscure the analytical response of molecules of interest. The ion soft-landing technique creates well-defined, high-value materials such as tiny metal and metal oxide particles of exact size and composition for studies in heterogeneous catalysis and electrochemical energy storage (e.g., supercapacitors and batteries). Summary: Researchers from Pacific Northwest National Laboratory and Purdue University—Julia Laskin, Grant Johnson, Jonas Warneke, and Venkateshkumar “Venky” Prabhakaran—were invited to prepare a review article based on their years of experience developing the ion soft-landing technique for studies in energy storage, materials synthesis, and catalysis. 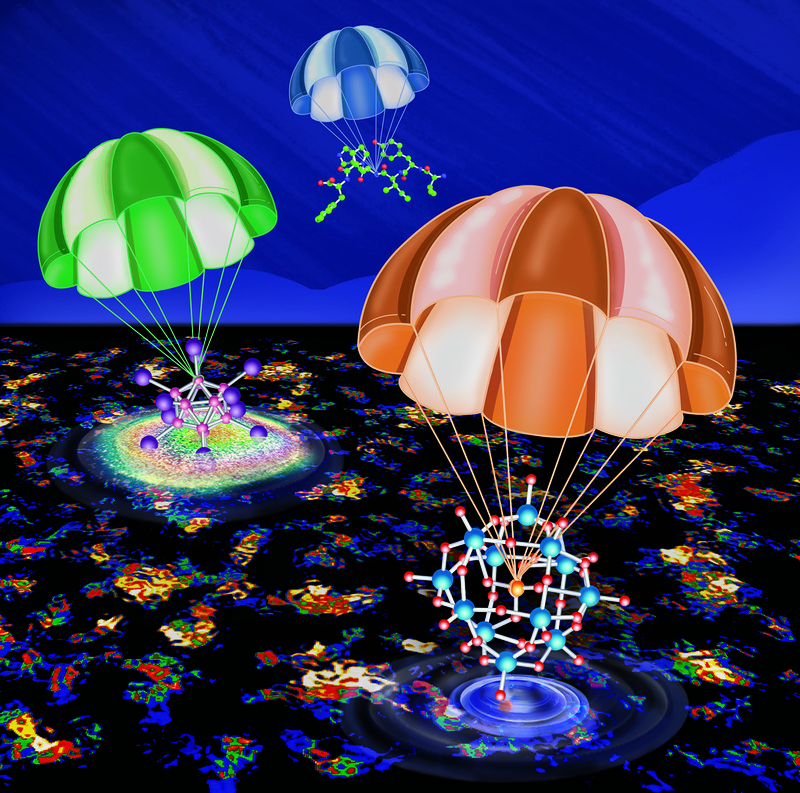 The team, positioned and determined to continue advancing the ion soft-landing technique into a unique approach for materials synthesis, selected the contents of the review after perusing hundreds of articles from scientists and colleagues at national laboratories and universities around the globe. Their review article in Angewandte Chemie International Edition—a Journal of the Gesellshaft Deutscher Chemiker—emphasized recent developments in ambient soft-landing, which allow certain advantages of ion soft-landing in vacuum to be reproduced on the laboratory benchtop at reduced expense and complexity. In addition, the team found that the technique can provide insight into how the properties of molecular ions at high coverages may be used to tailor the initial morphology and structural evolution of condensed-phase films. What’s next? The next step for ion soft-landing research is to control the three-dimensional arrangement of macroscopic structures formed through mass-selected ion deposition. This advancement will allow the properties of ion-based materials to be tailored with even finer precision. Acknowledgments: This work is related to the Basic Research Needs for Synthesis Science for Energy Relevant Technology, specifically the following Priority Research Directions: 1) harness the complex functionality of hierarchical matter, and 2) accelerate materials discovery by exploiting extreme conditions, complex chemistries and molecules, and interfacial systems. It is also relevant to the Basic Research Needs for Catalysis Science and Next Generation Electrical Energy Storage, specifically the Priority Research Directions: 1) design catalysts for efficient electron-driven chemical transformation, and 2) revolutionize energy storage performance through innovative assemblies of matter. Sponsors: This work was primarily supported by the U.S. Department of Energy (DOE) Office of Science, Office of Basic Energy Sciences, Chemical Sciences, Geosciences, and Biosciences Division and the Laboratory-Directed Research and Development program at PNNL. Support for Jonas Warneke came from a Feodor Lynen Fellowship from the Alexander von Humboldt Foundation in Germany. User Facilities: A portion of this work was performed using the Environmental Molecular Sciences Laboratory (EMSL), a DOE Office of Science user facility sponsored by the Office of Biological and Environmental Research and located at PNNL. Research Team: Grant Johnson and Venkateshkumar Prabhakaran (PNNL); Julia Laskin and Jonas Warneke (Purdue University). Reference: J Laskin, GE Johnson, J Warneke, and V Prabhakaran. 2018. “From Isolated Ions to Multilayer Functional Materials Using Ion Soft-Landing.” Angewandte Chemie International Edition, May 14, 2018. DOI: 10.1002/anie.201712296.